The site serves over 185,000 alumni worldwide. The Webster University Alumni Association is proud to announce the launch of its newly redesigned website, www.alumni.webster.edu, which serves over 185,000 alumni worldwide. In addition to providing improved ease of navigation and increased responsiveness on all smart devices, the updated site includes several new features such as an online directory of alumni-owned businesses, listings of past alumni award winners and notable alumni, updated career resources and alumni benefits, and volunteer opportunities for alumni. The site also includes individualized pages for each of the Alumni Association’s regional and international chapters and networks. 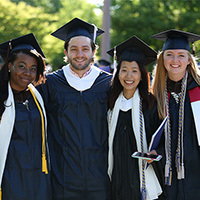 Visit www.alumni.webster.edu to tour the new site and learn more about the resources available to all Webster alumni.